Having a great collection of mixable and matchable separates is perhaps the best way to build up a decent ‘going-out’ wardrobe. You absolutely shouldn’t need to buy something new every single time you go out for dinner. It is perfectly possible to create a wardrobe that you can go to at a moment’s notice and pull out a handful of great options that suit you and make you feel good. You just need to focus your attention on only buying pieces that work for you and your style. Having particular tops to go with particular ‘bottoms’ is incredibly limiting. With a little bit of thought you can experiment and start buying new pieces with a different mindset. Three tops and two bottoms can make at least 6 outfits – change up the shoes and/or jewellery and add in a blazer and that’s even more option for you to play with. 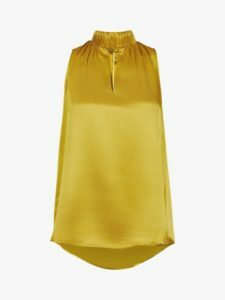 Here are some of my fave ‘going out’ tops that I’ve found on my recent browse in John Lewis (I am not affiliated with John Lewis, but it’s my favourite place for ideas and inspiration). Choose well and you’ll get a lot of wear and memories out of them. 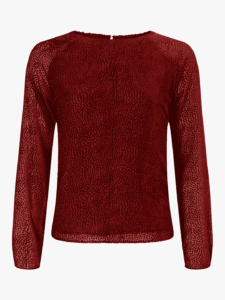 Red is the colour of the festive season and being velvet, it oozes glamour and luxury and will also keep you warm(ish). This tone of red would work well with navy, burgundy, a brighter red, chocolate brown, grey and of course black! 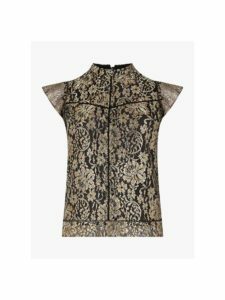 This top has an Edwardian feel and would work well over black or coloured trousers or over a skirt in a different texture (metallic pleats perhaps?). The cap sleeve will broaden your shoulders so is a great option for balancing out wider hips. This gorgeous gold top is flattering for warm skin tones. Tuck in if you have a waist and leave loose over slim leg trousers or a pencil skirt if you have a straighter figure type. Add a blazer if you don’t like to get your arms out. Blush is a beautiful tone on softer complexions (hair, skin and eyes are a similar tone) and gives off a luxe feel. The embellished neckline eliminates the need to work out earrings and necklace – a beautiful watch or cocktail ring would work beautifully. 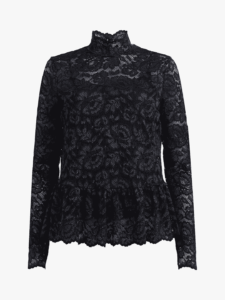 I love how this lace top has an inbuilt camisole, high neckline and sleeves but the sheer, stretch lace adds an element of femininity and slinkiness. 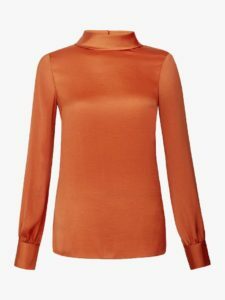 This top would work well over coated jeans or an oxblood leather mini skirt or even a pair of black jeans. Three totally different looks. 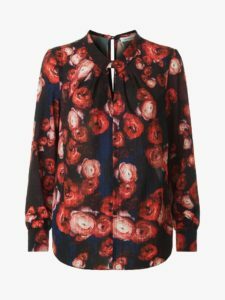 This beautiful floral blouse brings an elegant touch to a festive outfit. I’d love to see it tucked into capri pants (navy or black) or more casually over jeans with a stiletto heel, or tucked into a pencil skirt. 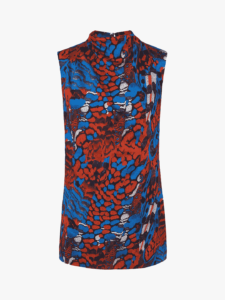 This feather print top would look super-stylish paired with black, navy, light grey or deep red. It would also work well in warmer weather over lighter fabrics. 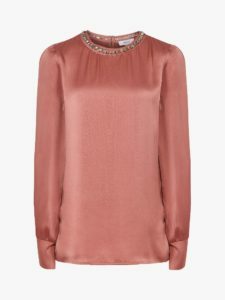 The fabric of this elegantly cut, copper-toned top gives a touch of understated glamour to an outfit. I’d add statement earrings, wide leg trousers and a heel. There’s something very Audrey Hepburn about being covered up from neck to wrist. I love this look. Would it be useful to have a blog post on skirts and trousers as staples for your wardrobe? Leave me a comment.